The hide of the ox was tanned into leather using oak bark. Many of the uses of leather, for example shoes, belts, bags and saddles, are still familiar today. However a wide range of other items were common in the past. Like horn, leather does not break when dropped. A lot of containers for water and other liquids were made of leather, such as buckets, pitchers and mugs. The seepage of water from leather buckets was acceptable. 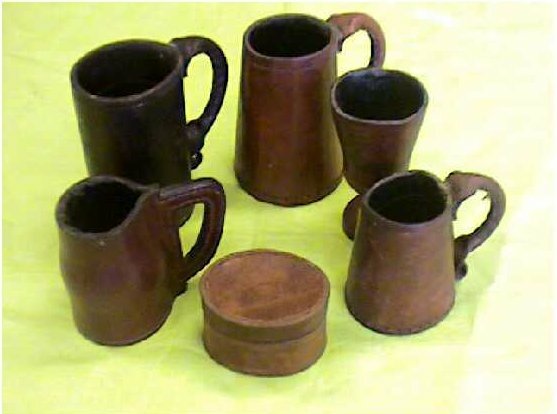 Mugs and pitchers for ale were pitched on the inside to make watertight containers. 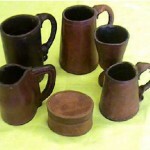 Such leather vessels cannot be used for spirits or hot drinks as these dissolve the pitch. Small boxes and chests of leather could withstand slightly rougher treatment than wooden examples. In medieval times, everyone carried their general purpose knife in a leather scabbard.